Source: UNEP. Evaluation of environmental impacts in life cycle assessment. E-LCA is a time tested assessment technique that evaluates environmental performance throughout the life cycle of a product or from performing a service. The extraction and consumption of resources (including energy), as well as releases to air, water, and soil, are quantified throughout all stages. Their potential contribution to environmental impact categories is then assessed. These categories include climate change, human and eco-toxicity, ionizing radiation, and resource base deterioration (e.g. water, non-renewable primary energy resources, land, etc.). 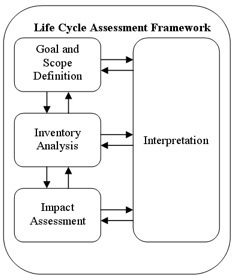 The Life Cycle Initiative played a key role in the development of the life cycle assessment midpoint-damage framework, which conceptualizes the linkages between a product’s environmental interventions and their ultimate damage caused to human health, resource depletion and ecosystem quality – information which is of critical importance to decision makers. According to the ISO 14040 series, LCA is structured in four phases (See Figure). Regardless of the type of LCA, the process of the assessment remains the same. Types of LCA include environmental LCA (E-LCA), social LCA (S-LCA), and life cycle sustainability assessment (LCSA).